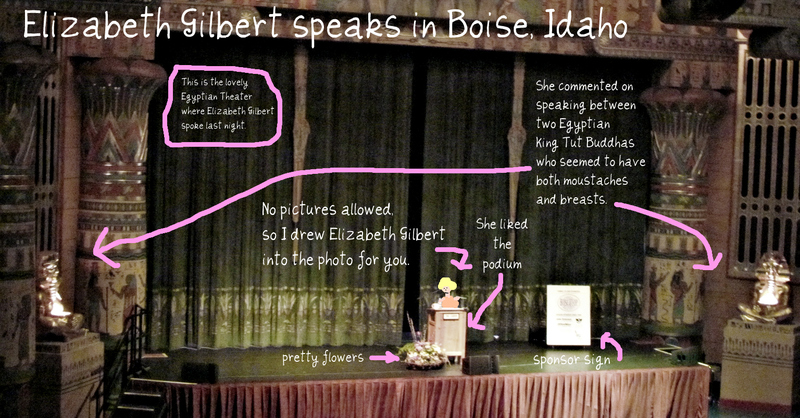 Last night I went to see the lovely Elizabeth Gilbert at The Egyptian Theater in Boise, Idaho. The house was sold out - as well it should be. Gilbert was a wonderful speaker. Most of the prepared speech centered around Gilbert's marriage to writing, beginning with a vow she made to her craft at a young age. She describes stages of her writing in terms of relationship. As a young woman, she and writing lost themselves in passion. She didn't need money for her craft, only to be with it, to commune with it, to get lost in it. Then she sold her first article to Esquire and her relationship to writing changed and matured. She started to have expectations of writing. She says when Eat, Pray, Love made it big, it was like being married to an accountant for twenty years and waking up next to a rock star. "I'm not sure this is good for our relationship," she quipped. The next book brought the relationship to crisis. Her best-selling memoir provided financial security and success. She wrote that next book, looked through it, and realized it was not good. She described how artists all know the feeling of the art not living up to the vision we have of the art---"like a non-identical twin"---and then she added: "This was not like that. This book really sucked." For the first time in her life, she took time off from writing. In relationship terms, she said this was the point when she looked across the table at writing, the kids grown, the successes lived, and she asked of writing, "Why are we still doing this?" The talk culminated in her realization that she'd been trying to write to please all the readers of her very-successful memoir, something she'd never before tried to do. Writing returned to her when she remembered she'd always just written from her heart. If she remained loyal to the natural flow of words, she might never have another huge book, but that would be okay, because she'd still be in her relationship with writing. Gilbert was delightful and warm. She flattered Boise with her comments on the city, The Egyptian Theater, and The Cabin (sponsor of her appearance). She took questions after her talk and, although she clearly answers many of the same questions at every appearance, she responded generously and thoughtfully. One of my favorite replies was to a question about critics who say Eat, Pray, Love is too self-absorbed: "It always amuses me when someone levels this criticism at a memoir. It is a memoir." The line for Gilbert's post-talk book signing? Seriously long. I had heard that criticism of the book, but have reserved judgment, because I haven't read it. sounds like it was a fun presentation for you. That certainly is an impressive hall. Makes me think of the movie Young Sherlock Holmes, and the London Egyptian Cult. It was a really fun talk. If I didn't know it already, the audience buzz alone would have convinced me: this one book had a very deep impact on a lot of people. Her perspective on writing, on the author's relationship with writing, nearly sounds worthy of a memoir itself. Thanks for passing it on to us, Johanna. These are the sorts of thought-models which help so many of us. I'm sure I'll reflect upon it time and again. Oh - and the photo is fantastic! Never seen Elizabeth Gilbert give a talk in person, but have heard several interviews. She comes across just as you describe her here. Thanks, this is very interesting! I was not actually a fan of EPL, but enjoyed your review and might really have liked hearing her talk about the writing process. Her new book was so bad I couldnt read past the first chapter. Personally, I think it has nothing to do with craft or story, but stakes. It's hard to empathize with a woman who has it all - to take the journey with her when that journey is short, clear of minefields, and you know how it's going to end. Obviously this was not the case with the first book. I saw the beginning of her marriage analogy on her website and she didn't really win me over with it. In person, over the course of her whole talk, she made it work. She is really warm. The audience became part of the experience for me. EPL certainly touched a lot of people and I could hear it in the conversations around me. Yes. I came away feeling that I had a good snapshot of her experiences as a writer. I was really more inspired by her early career than by her huge success with EPL. I haven't read the new book, but it makes sense to me that the journey of self-discovery in EPL is going to resonate with more readers. I'm of a mind that a hit book says those things that a great number of people need to hear when it comes out. Copyright Johanna Harness, 2014. Travel theme. Powered by Blogger.